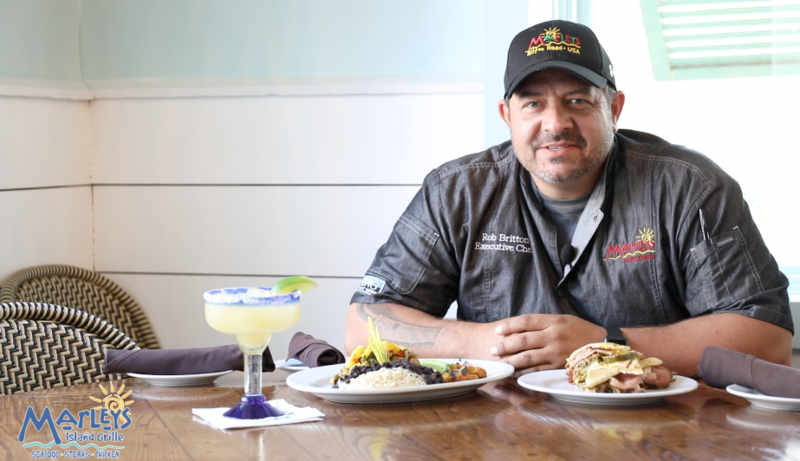 We are so excited to welcome back Rob Britton to the SERG Restaurant Group team, as our Executive Chef at both Marleys Island Grille & Marleys Shrimp & Burger Shack. Marleys Island Grille is a casual, upbeat, fun and tropical Hilton Head Island dining experience. 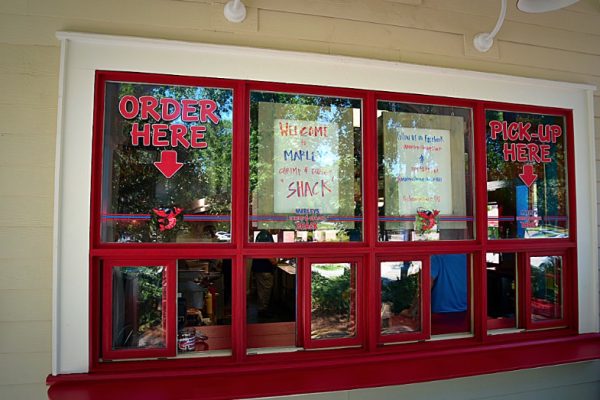 Marleys Shrimp & Burger Shack is a convenient walk-up, ‘order here’, fast casual concept. 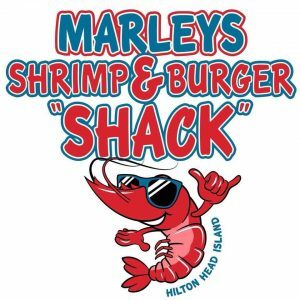 At Marleys Island Grille & Marleys Shrimp & Burger Shack, high quality ingredients are key in everything we do. That’s why Executive Chef Rob Britton started a program to bring in select local produce to our menus. Before Chef Rob brings new food items to our guests, he goes the extra mile to see and meet the farmers, inspect their livestock, and taste the local produce for himself. 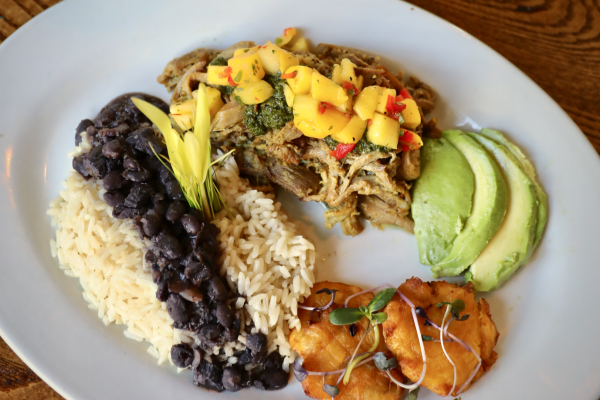 From our authentic Cuban Sandwich at Marleys Shrimp & Burger Shack, to our delectable daily specials at Marleys Island Grille… our guests can be confident that our food will exceed all expectations. 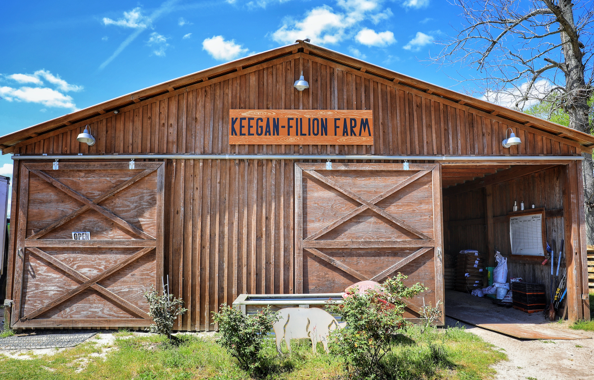 Keegan-Filion Farms started in the mid 1930’s by Annie Filion’s great grandfather and grandfather. Keegan Farm was known as a corn, cotton, cattle and chicken farm. Annie’s grandfather, John Andrew Keegan, had several thousand laying hens and sold fresh eggs out of the back of his pickup truck to local restaurants and residents. Later, Annie’s father and uncles would raise cattle, corn, hay and hogs. The corn and hay fed the cows. Then, the cows were sold at the local stockyard, the hogs were also sold at the stockyards or used to feed the family. All animals over at Keegan-Filion Farm are all free range, pasture fed, and have 24 hour access to pasture. Chickens are housed in chicken tractors and moved to new ground daily. Hogs are raised in pastures planted with special pasture mixes that provide them the most nutritional benefit. Steers are rotated through several pastures providing them the best grass in spring, summer and fall. During winter months they are fed Coastal Bermuda and Sorghum Sudan Grass hay. Chickens, turkeys and hogs can’t survive on grass alone. To help maintain the health of these animals they are provided 24 hour, free choice, supplemental feed. These feeds are specially formulated and consist of corn, soybean meal, vitamins and minerals. At no time are the animals provided anitbiotics or animal based proteins. It is only right that the animals end their lives as humanely as they have lived it. All of the animals on the farm are processed at a USDA inspected, Certified Humane processing facility. Swine should not be confined in gestation or farrowing crates, but rather raised in conditions that allow them to have freedom. For generations, Keegan-Filion Farm has chosen to sell their products directly to restaurants and to local families. Today, the farm’s products can be purchased at the Summerville Farmer’s Market. Customers may also purchase Keegan-Filion Farm products directly at the Farm Store on Mondays and Fridays from 1 until 6. 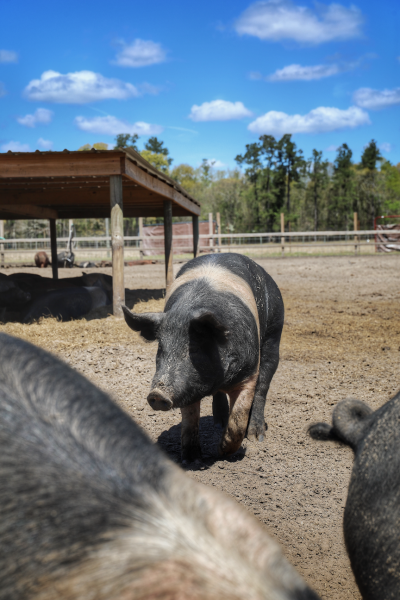 At Marleys Island Grille, we take great pride in being able to source our pork from a hardworking local farmer. One bite, and you’ll surely taste the difference of locally sourced, high quality cuisine for you and your family, from farm to table. All of our Executive Chefs at the SERG Restaurant Group take great pride in finding the absolute best ingredients to serve to our guests! 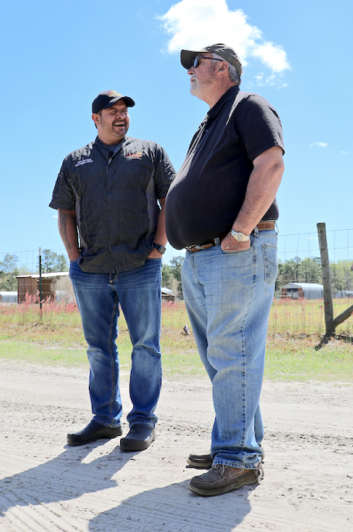 Watch the video to see Executive Chef Rob Britton speak with the owner of Keegan-Filion Farm about their livestock. You will also find pork from Keegan-Filion Farm at Marleys Shrimp & Burger Shack, located right next door to Marleys Island Grille. Enjoy scratch made shack specialties that have made us famous! Inspired by our travels up and down the East Coast experiencing the great seafood shacks, SERG Restaurant Group felt there was a need for a walk-up, “order here”, fast casual concept. We felt that guests needed a place where they can sit outside at picnic tables and enjoy quality food at reasonable prices. 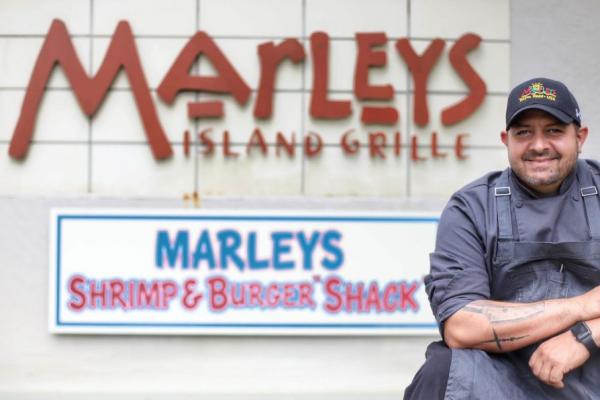 At Marleys Shrimp & Burger Shack, you’ll have the chance to enjoy mouth watering griddle burgers with all the fixins, New England Style Seafood Bowls, Fish & Chips, Deviled Crab Cakes, Seafood Baskets, and more! 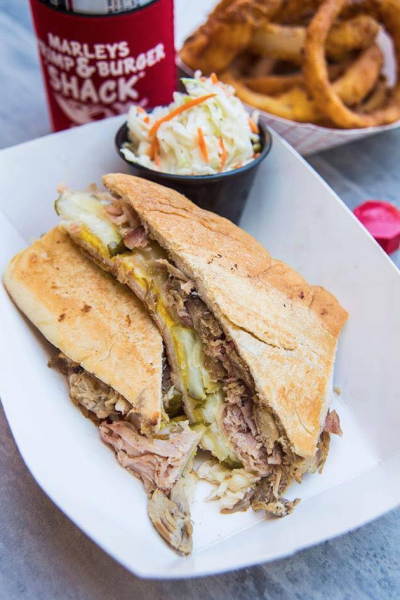 You can enjoy pork from Keegan-Filion Farm when you order our delicious Cuban Sandwich. The Cuban Sandwich is available at Marleys Shrimp & Burger Shack 7 days a week. On Saturday, we run our famous $6 Cuban Sandwich special for lunch and dinner.